Spring is here which means summer adventures aren’t too far behind! You need a vehicle that is as ready for the fun as you are. You need the 2019 VW Golf Alltrack! At Emich Volkswagen in Denver, we have an amazing selection of this fun-to-drive, adventure-ready wagon. Each of our Alltracks has a super variety of features that make it perfect for your trips to the Colorado mountains and just as perfect for your daily commute. Your Golf Alltrack will come equipped with the very capable 4Motion all-wheel-drive system. This feature effectively transfers torque between the front and rear wheels as needed for optimal handling and control. Get reliable traction and stability that automatically adapts to the road conditions. So, you don’t have to do anything but focus on your adventure. This is available with either the manual or automatic transmission option. The Hill Descent Control is especially helpful when descending slippery steep grades. It can control the vehicle’s brakes to keep your vehicle at a controlled speed. Alltrack‘s Off-Road Mode helps you take on a variety of roads by optimizing traction control and driving dynamics. The available Paddle Shifters put the ability to quickly shift at your fingertips. The Volkswagen Golf Alltrack provides dependable power and performance with its 1.8L TSI turbocharged engine. This engine provides 168 hp and 199 lb ft of torque. You can count on an estimated 21 mpg city and 30 mpg highway. 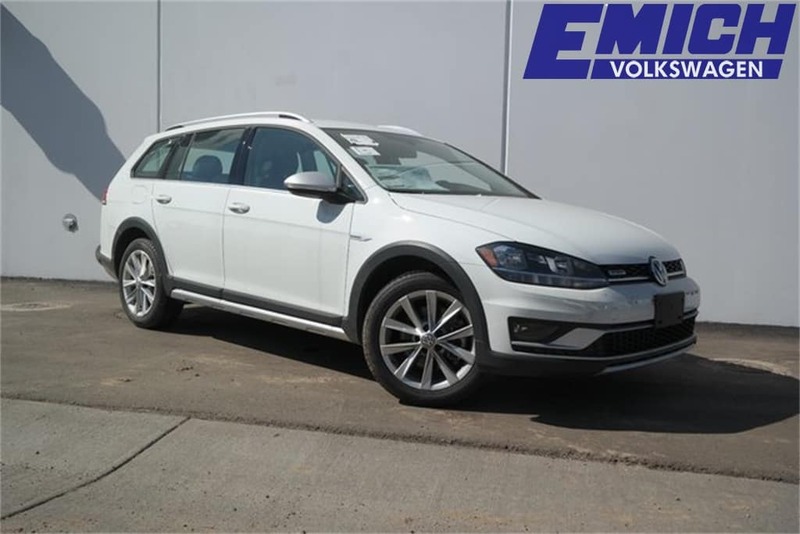 Visit Emich VW to experience the powerful and practical 2019 Volkswagen Golf Alltrack! We have many for you to choose from so you can find the perfect one for you. Be ready for the beautiful spring and summer adventures you are sure to have. Plus, know you will be ready when winter weather returns again with it’s exciting driving challenges!